Today, Joshua Prince and myself secured another victory for Second Amendment jurisprudence in Miller v. Sessions, et al., 2:17-cv-02627 in an issue of first impression across the United States. Judge Eduardo Robreno of the Eastern District of Pennsylvania ruled in a 25 page memorandum that it was unconstitutional, as-applied to Mr. Miller, to prevent him from exercising his Second Amendment right as a result of a 1998 misdemeanor conviction under the vehicle code – specifically, the alteration of a PennDOT window tint exemption form. This action is about one citizen’s individual Second Amendment right to keep and bear arms. The citizen wishes to purchase and possess a firearm. The Government contends that under 18 U.S.C. § 922(g)(1), the citizen is permanently banned from possessing a firearm because of a 1998 misdemeanor conviction under the Pennsylvania Vehicle Code. The citizen challenges the federal statute as unconstitutional as applied to him. The citizen wins. As a result, the Court enjoined the Government from enforcing, directing the enforcement, or permitting the enforcement of the felon-in-possession ban of 18 U.S.C. § 922(g)(1) against Mr. Miller. 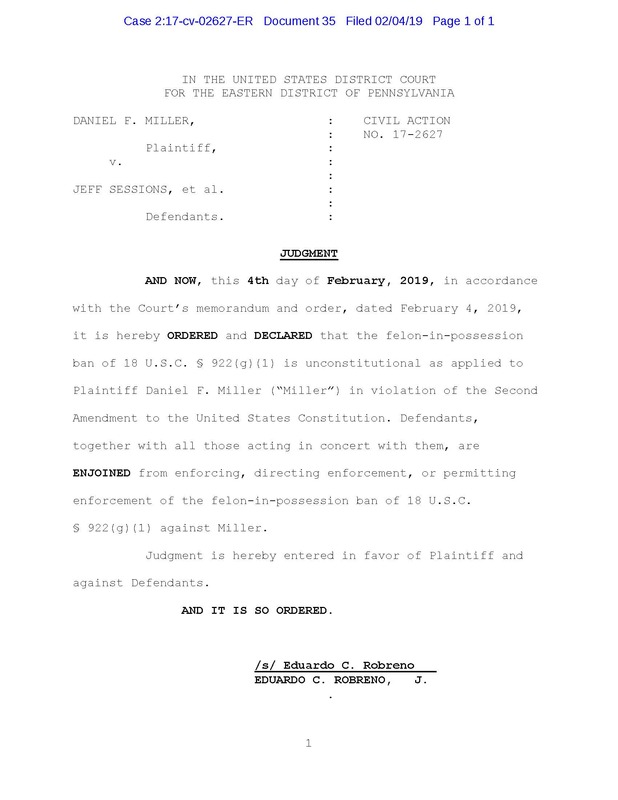 While the order is only in relation to Mr. Miller, the Court’s holding is indicative of the willingness to continue to grant relief to certain individuals who may be barred from possessing firearms under federal law due to a non-violent misdemeanor conviction. Individuals who find themselves prohibited due to a non-violent misdemeanor offense and wish to challenge the bar on their ability to possess firearms and ammunition can contact Firearms Industry Consulting Group today to discuss their rights and legal options. Updated 2/5 to reflect that it was the Eastern District of Pennsylvania and not the Middle District of Pennsylvania. No constitutional right should be removed for any misdemeanor. Applying THAT standard, not a single freaking bureaucrat, cop, or politician should ever be allowed to look at a picture of a firearm, much less touch one. Awesome! Somebody start a GoFundMe collection to buy this man a gun. The correct wording would be, “…and I…”, counselor. So the punishment for the crime of the alteration of a PennDOT window tint exemption form is more than 1 YEAR? Prohibited person: convicted in any court of a crime punishable by imprisonment for a term exceeding one year. Pretty harsh, methinks. Seems to me a fine, slap on the wrist and revoke his window tint permit (or whatever) and make him redo the form.